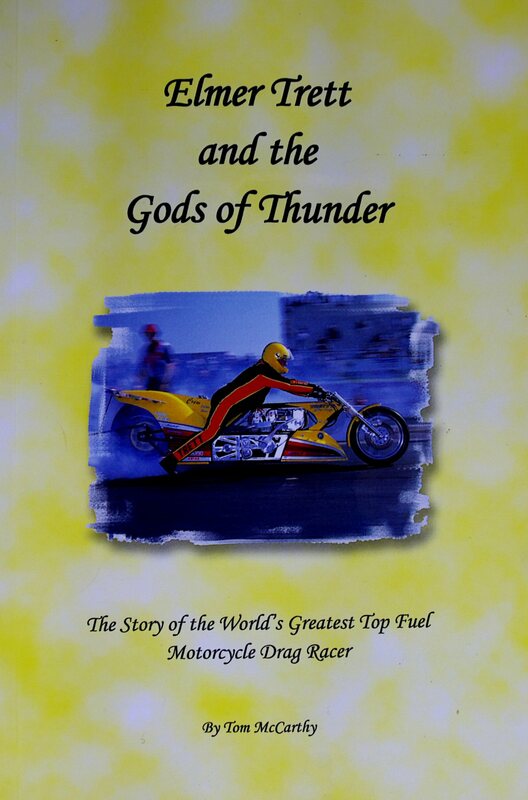 One of the great Top Fuel drag bike racing teams, that pounded drag strips for a few decades, recently shared a bit of drag bike racing history with me worthy of repeating. It’s important for members of today’s sport to know of their roots from yesteryear. For without this past the sport would not be where it is today. Respect your elders are words that should not be taken lightly. Wisdom comes at a high price and takes years to develop, just like Top Fuel drag bikes do. Turning the clock back, to younger days: Top Fuel pilot Pete Hill sits astride his supercharged, fuel injected Knucklehead, Harley Davidson nitro-burner in the staging lanes at some drag strip in middle America awaiting his call in the staging lanes. With his signature Champion Spark Plugs floppy hat on, Pete is ready to inch forward to upper staging with his crew chief of many years, Jackie Hill beside him and fire up the world’s fastest Knucklehead drag bike. He feels a tug at his T shirt and looks down at a small boy. The young man with dark hair and full face is beaming and speaks boldly with sincerity to the old drag bike racer “Hey my daddy is just as fast as you are. Just sometimes his bike ain’t.” Pete grins at the little boy and nods to him, “I’m sure you’re right about that.” Jackie, Pete’s wife of many years is grinning from ear to ear remembering this treasured memory she shared with me recently, as if that hot summer’s day was yesterday. When little Tony Ruggiero tugged on Pete’s shirt to tell him about his daddy, Top Fuel Harley racer Steve Ruggiero, it was racing families sharing what only fellow racers will ever know; the brotherhood of the extended family that binds fellow racers together. And from this the memories are forged from combat out on the drag strips. It’s yesterday that breeds today you see. Now some decades later, Pete is retired from racing his Top Fuel bikes and now Tony Ruggiero is a Top Fuel Harley racer. From the past comes the future. Jackie shared that story with me when I recently I had the pleasure of attending the Concours d’Elegance of America at St. Johns, in Michigan. 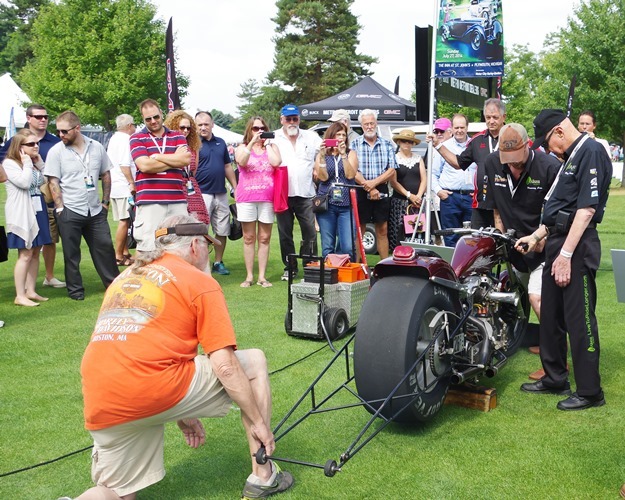 The prestigious Concours d’Elegance of America car show, held at the Inn of St. Johns, was one of great honor for motorcycle drag racing world. 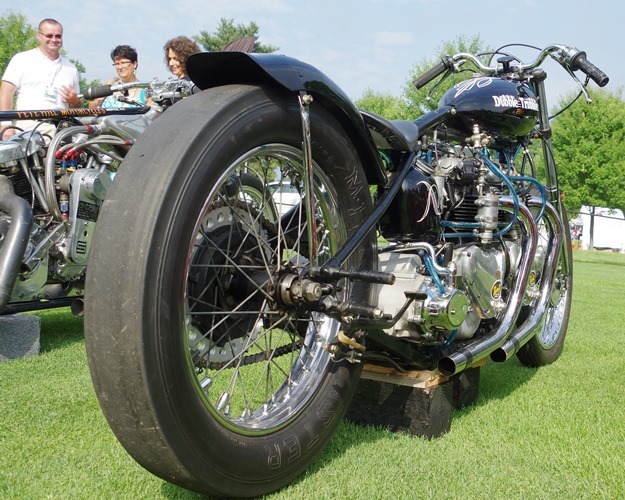 For the first time in the 36 year history of the event, they extended an invitation to the motorcycle drag racing world to include legendary motorcycle drag racing machines from various classes of historical prominence. There were nine very famous and historical machines in attendance by special invitation. From the Funny Bike (F/B) class of motorcycle drag racing, a Harley Davidson Sportster powered drag bike owned by Ray Price was on hand under the watchful eye of Mr. Price who hails from N.C. Ray not only proudly presented his vintage drag bike of he created, but his race team fired it up for the crowd, much to their delight, filling the afternoon air with the heavenly acrid fumes of nitromethane. From the class of Top Fuel, the nitromethane powered Vincent know as “The Barn Job,” and also “Stagefright” both owned by noted author John Stine took their places in the viewing arena beside Pete Hill’s supercharged Knuckelhead as well as Frank Spittle’s “Freight Train” double engine T/F bike. These four Top Fuel bikes, in their day, were all world record holders and they span an era of T/F bike development from the 1950’s into the 1990’s. For the Harley Davidson faithful, there are few motorcycles more legendary than Pete Hill’s Knuckelhead powered drag bikes. 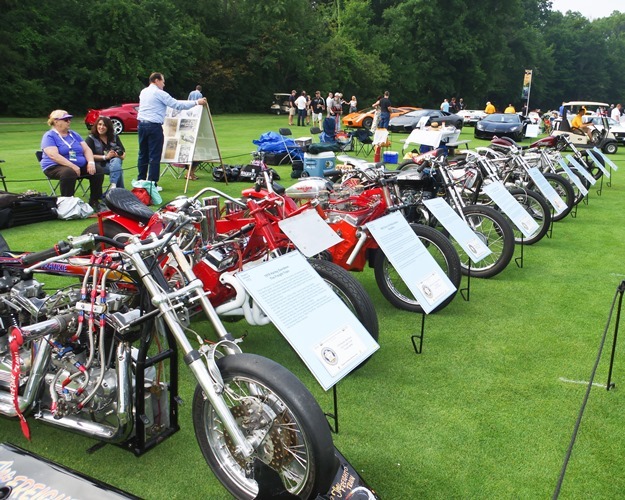 Three spectacular and world famous “exhibition” drag bikes were also a vital part of the display. EJ Potter, well know throughout the drag racing realm as “The Michigan Mad Man,” who is world renowned for his automotive V-8 powered drag bikes, was well represented. Two of his former motorcycles, fully restored by current owner Clyde Hensley, commanded great presence. “Bloody Mary” one of EJ’s first creations and his well known “Widow Maker” both gave viewers something to think about. 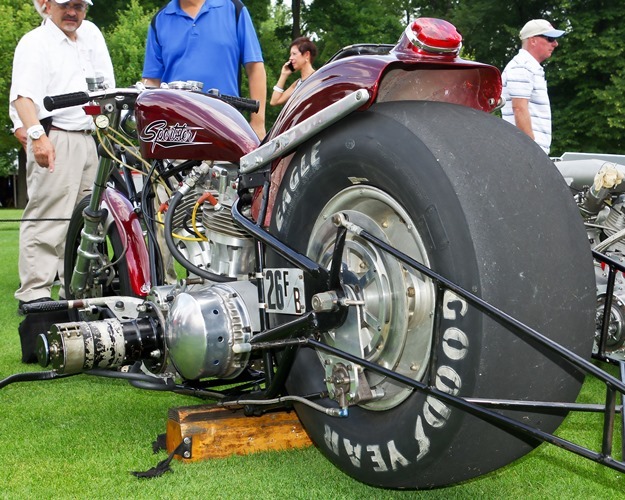 Imagine if you can, trying to handle a Chevrolet V-8 powered drag bike with a bald slick behind you, smoking the tire for a full 1320 feet of race course. Booked for packing grand stands time and again, EJ’s bikes are a tribute to an era of drag racing when the spectacle of racing was more important than the performance of the machines, back when the show mattered more than go. Another exhibition motorcycle on display may be hard to imagine as a drag bike. More accurately it’s a rocket bike and an important motorcycle in the history of motorcycle drag racing. Larry Welch’s “Heavy Trip” rocket bike, powered by not one, but two hydrogen peroxide motors sat amongst the fuel bikes with a unique presence. Its chrome and polished elements, attached to various tanks and gauges, was in stark contrast to its reciprocation powered counterparts. The twin outboard rocket motors sat quietly astride the rear wheel with its large diameter brake rotors on each side of the wheel. There is an eerie aura to the bike, you can sense its quiet violence sitting there poised as if to strike. For interested parties with a flair for dare, Larry informed me that the bike is for sale with a price tag of $40,000 dollars, US currency. 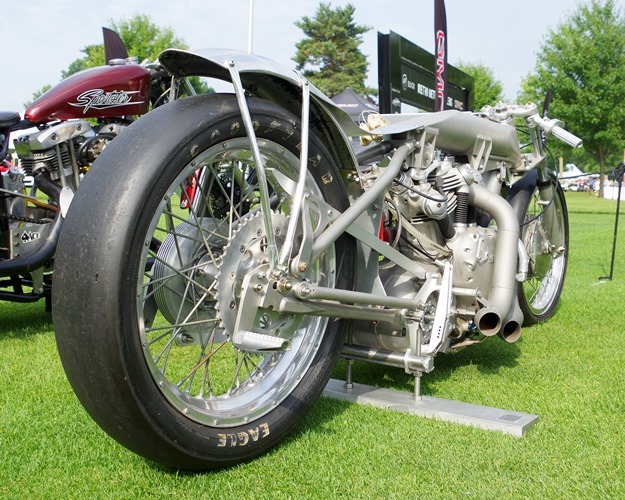 The “Best in Show” award for the event went to the oldest fuel bike on display, “Double Trouble” created in 1953 by Bud Hare, now owned by Glen Kerr. This is one of the oldest known fuel bikes in existence from the earliest days of drag racing that is still operational. Twin 40 CID Triumph motors, one behind the other, with a Harley Davidson gear box behind them make this bike a tribute to the golden age of drag racing when racers had to make everything by hand from whatever they could lay hands on to go racing. The motorcycle is fully operational and can be roller started today, just as it was back in the 1950’s. Mr. Kerr still starts the bike on occasion and the sight of the rollers and the sounds of the engines coming to life bring tears of joy to drag bike racers and fans alike as they are transported back in time when brave young men, white knuckled, rode these bikes to glory just for the sheer joy of it. There were no points systems, no sponsors, no insurance companies to muddy the waters back then. There was a time in America, when racing was about the sport of racing. All of these motorcycles were from that era. So were the men who built them. 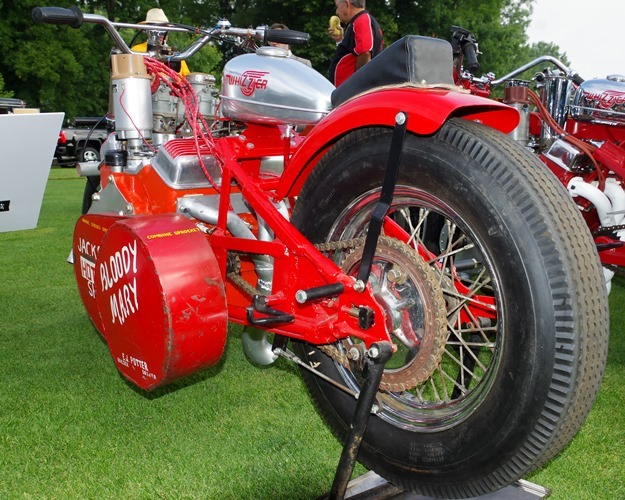 Pete Hill, when asked why he stuck with racing a Harley Davidson Knuckelhead motor design for close to four decades replied, “I wanted to see how fast I could make it go. I know there’s still more in it today than what I found. It was never about how fast I wanted to go. If I just wanted to go fast, hell, I can go buy an airplane ticket anytime and go fast as I want to. I wanted to see what I could make it do.” From the past comes the future, take time to remember and salute your past, this is history at it’s best. Larry Welch commissioned the rocket bike and rode it, but didn’t build it. The rocket motors, propulsion system, and frame were built by Arvil Porter. I am glade to see history . So many people don’t know the engineering process it take to develop a fast motorcycle This is something you just dont buy at the store .Real craftsmanship . Roy Strawn, you have this exactly correct I was there that day looked at Rocket Welch’s bike in the pits next to his van. I witnessed two cops attempting to stop him from making the run. The fat cop was right behind that bike when he took off, practically blew him over backwards … what a show. You’re right he had his left hand in the air all way down the strip, he was wearing an orange T shirt. They (the cops) picked him up at the end of the strip. Larry Welch’s rocket bike was legal at AHRA and IHRA tracks. I saw him run at Lakeland in 1976. Larry’s bike was the first drag bike to run 200 mph. I was there at Atco when Welch ran that rocket bike also. I’ll never forget it and I tell that story to this day to my motorcycle buddies. I remember seeing Larry give those cops a blast of smoke then rocketing down the strip with a hand in the air. He came back in a paddy wagon handcuffed. Cycle racing back then was dangerous. I remember a Harley racer at Cecil County Dragway in the mid-70’s that went through the finish line at 150 mph and losing control and hitting the guardrail killing him. I think you were there too Roy. PS..May I put a link to this in my Drag Racers Reunion page? The diversity of this show is unparalled in drag racing history and may never be repeated. 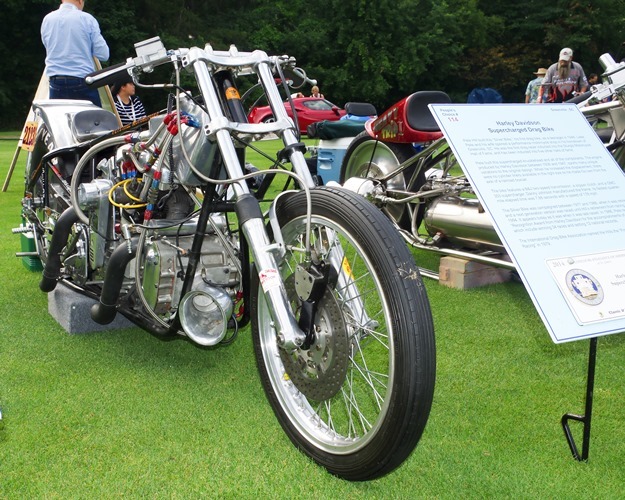 Larry’s Rocket Bike is as much of the history as any of the bikes displayed. My father Lloyd Krant won the first AMA/NHRA drag racing event at Pomona CA on April 12, 1953. He also won the second AMA/NHRA drag racing event at Paradise Mesa in San Diego CA on July 19, 1953. My question is when did the AMA/NHRA put together their next event where they raced together as they did at the first two events? Was it outside of California? Or did the AMA and the NHRA begin to drag race separately? If separately, when did they join forces again? Guy, you father is truly one of motorcycle drag racing’s greatest. I regret I never had the opportunity to meet him. 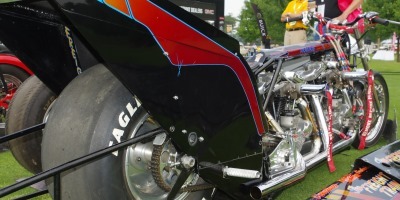 Larry Welch’s rocket bike was accepted at AHRA and IHRA tracks, and was the first drag bike to run 200 mph.